The integrated system of safety components provides unmatched protection for your child. These features include a steel frame, energy-absorbing base, V-shaped tether to minimize seat rotation and staged-release stitches that slow and reduce forward movement during a crash. The Frontier ClickTight includes not 1, but 2, strong layers of side energy absorption. A deep foam-lined shell and quick-adjust head protection shield your child from side impacts. The Frontier ClickTight safely and comfortably holds your child from preschool through the elementary school years. The easy-adjust harness grows along with your child with 9 different positions. The perfect blend of trusted safety, relaxing comfort and superior convenience make the Frontier ClickTight an exceptional Harness-2-Booster Seat for your growing toddler. With our revolutionary ClickTight Installation System, now everyone can install the car seat securely and confidently by just buckling the seat belt. You simply squeeze the release button to open, buckle the seat belt across the belt path and then click the seat shut for a proper installation every time* - no shoving, kneeing, or yanking required. SafeCell Impact Protection surrounds your child in safety components that work together to protect well beyond the established federal safety standards. 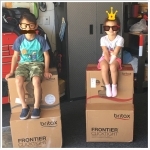 The Frontier ClickTight also features Complete Side Impact Protection PLUS providing an advanced layer of protection with a deep protective shell and an energy-absorbing foam headrest designed to keep your child?s head and neck extra secure. The proper fit is essential when it comes to safety, so the Frontier ClickTight includes our Quick-Adjust, 9-Position Harness and 2-Position Buckle to keep up with your growing child. The EZ-Buckle System stays clear of your little one when placing them into the seat and Plush Foam Padding provides premium comfort at every touch point once they're on board. Integrated Cup Holders and Storage keep snacks, drinks and toys close at hand and there is even a simple Front-Adjust Recline so your toddler can sleep in comfort when the time is right. The Frontier ClickTight Harness-2-Booster Seat can be used in Harness Mode for children 2 years old and 25 lbs up to 90 lbs or in Booster Mode for children 40 lbs up to 120 lbs. 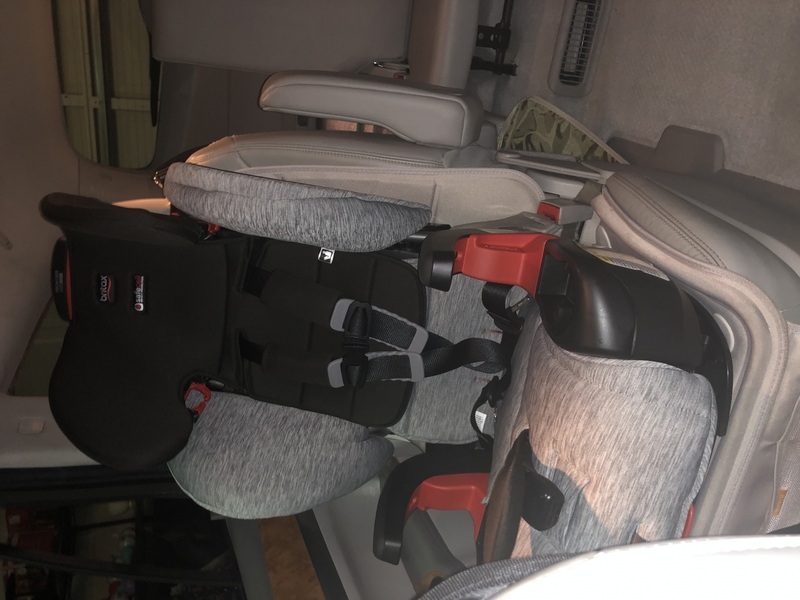 When your child is ready for Booster Mode, the harness can be safely tucked away the within the seat to easily transition the Frontier ClickTight into a high-back Booster without any hassles. Whether you are heading to the market or hitting the open road, you can travel with the peace of mind that your growing child is comfy, safe, and secure now, and for the adventures yet to come. *May not be compatible with all vehicles. See user guide. SafeCell Impact Protection is an integrated system of safety components that work together to protect your child well beyond the federal safety standards. Including an Impact Absorbing Base, Tether and Harness, an Impact Stabilizing Steel Frame, and Complete Side Impact Protection PLUS, SafeCell means your child is surrounded in best-in-class safety. Quick-Adjust, 9-Position Harness and 2-Position Buckle allows you to easily move the harness upward and buckle outward for a comfortable, secure fit as your child grows. SafeCell Impact Protection is an integrated system of safety components that work together to protect your child beyond the federal safety standards. Including an Impact Absorbing Base, Tether and Harness, an Impact Stabilizing Steel Frame, and Complete Side Impact Protection PLUS, SafeCell means your child is surrounded in best-in-class safety. SafeCell Impact Absorbing Tether minimizes seat rotation with a unique two-strap design and slows forward movement with Britax's patented rows of stitching that 'give-way' one at a time. Compatible with SecureGuardTM Clip to keep vehicle seat belt properly positioned on your child's hips when in Booster Mode minimizing the risk of abdominal injury (accessory sold separately). Safety Proudly Made in the USA. Front-Adjust Recline easily alters the seat angle for your child's comfort. 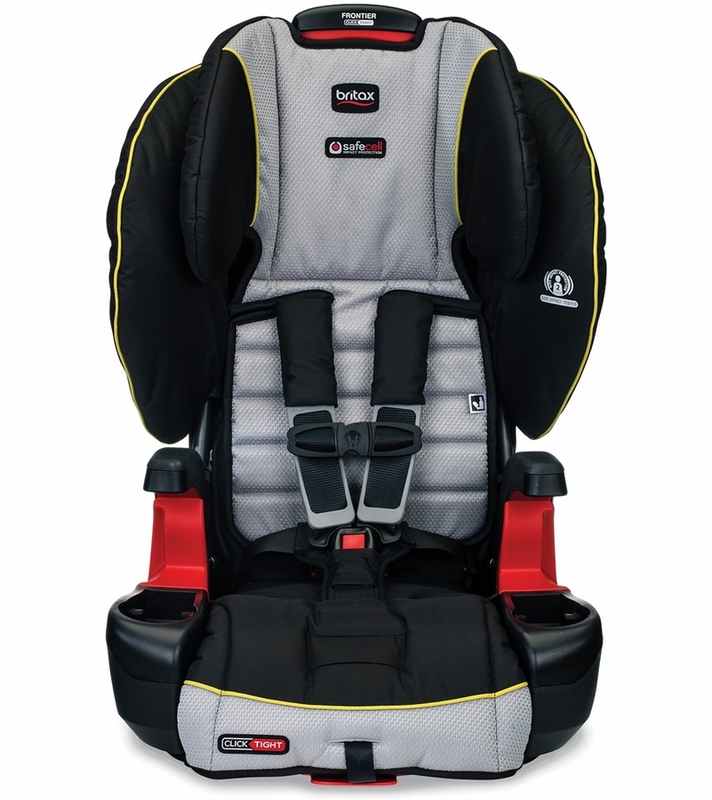 Plush Foam Padding in the cover, buckle pad, and shoulder pads surround your child in comfort at every touch point. EZ-Buckle System keeps the buckle out of your way when placing your child in the car seat. 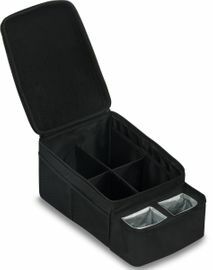 Integrated Cup Holders and Storage keep drinks, snacks and toys close at hand. 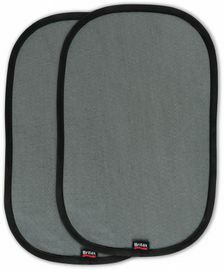 EZ-Remove Cover for cleaning convenience. Hassle-Free Transition easily converts from Harness to Booster by safely tucking away buckles and straps within the seat. Easy-On / Easy-Off LATCH Connectors locks into place with an audible click to both secure the seat in Harness Mode and prevent it from becoming a projectile when unoccupied in Booster Mode. I am an avid Britax Click Tight user and this seat didn�€™t disappoint! Propped installation was easy and the print is just adorable. I recommend this easy to anyone looking for a �€œlast�€ seat. I am absolutely amazed at how it easy this car seat is to install. The height of the seat can be adjusted without having to be rethreaded. It looks like a seat not "car Seat" so the older child wont protest. The clicktight is amazing to use in third row vehicles that may not have latch system. Comforted knowing my child�€™s seat is secure and properly installed. I love how easy this car seat was to install, but best of all I that my daughter enjoys being in this seat. She's never been a fan of being in her car seat (that's putting it mildly), but with this one, she's comfortable and she doesn't mind. I have 5 britax car seats and love them all. It is the only brand I will buy. The click tight makes install easier than any other install. This seat is also very comfortable! My daughter loves it! I was looking specifically for this car seat as it has the highest harness strap settings and the most allowable weight using the harness (according to my research). My daughter is disabled and I need to keep her in a harness for as long as possible - this seat will allow me to do so. And she LOVES it! It makes her feel like a big girl! Bonus: this was the lowest price I could find! Please note this seat is HEAVY! But that's because of it being so well made. So easy to install with the ClickTight system. Extremely happy with our purchase. 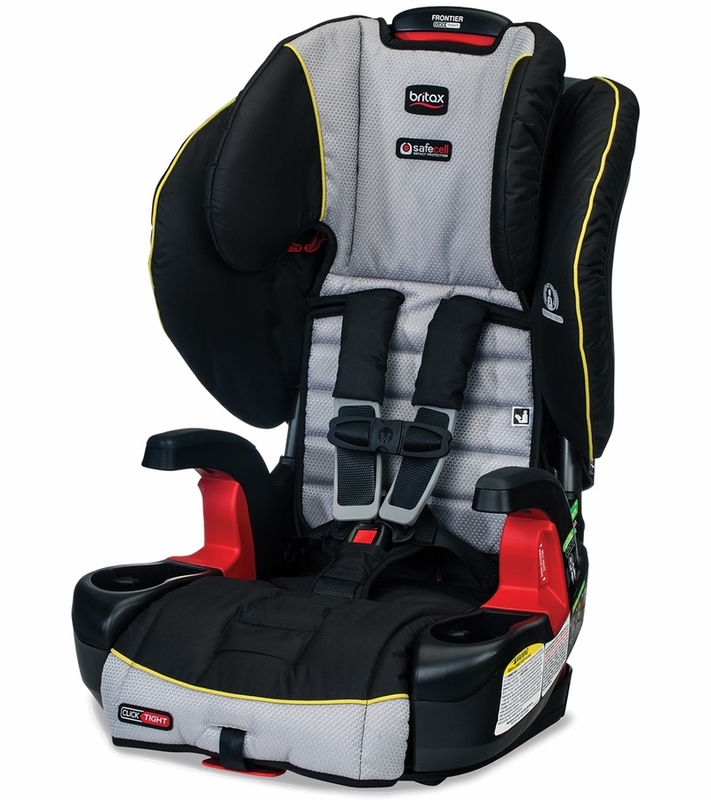 We love our Britax Frontier ClickTight Harness Booster Car Seat. Our favorite features are super easy installation, two cupholders, the armrests and of course the Cowmooflage print! It fits great in our SUV and our Truck. Definitely worth the investment! Best Big kid seat on the market! I would definitely recommend this seat for forward facing children that have outgrown the rearfacing limits on their seat as this is forward facing only and should t be used until the child is older. We own three of these in two styles. My only complaint is that it can be difficult to fully tighten the straps. Great easy to install carseat! I am really pleased with this car seat. It was ridiculously easy to install using the ClickTight system (after watching a short YouTube video about it). My son says it is comfortable (and loves having 2 cupholders). I am also happy it will hopefully be our last carseat purchase for my older son, since it will convert into a seat belt adapter/booster seat. I was slightly intimidated by the thought of the clicktight system but it is SO easy. Hands down easiest installing car seat I�€™ve dealt with in the last 20+ years. This car seat does not even use the bars that are now behind all seats. It depends completely on the regular seat belts to hold it in. There is NO WAY it can ever truly be tight; let alone "Frontier Clicktight". I plan to return this immediately, I must say I expected more for this price and from Britax. Looked at many reviews and decided to .ake the jump, very easy to install and our 3 year old loves it. He is very tall for his age therefore this seat accommodates him very well. This is our second Frontier. While more expensive than a lot of other comparable harness to booster seats, we will gladly spend it, everytime! Clicktight makes installation a breeze and ensures that it�€™s done correctly. The seat itself is quite heavy, due to the steel frame so that is definitely something to keep in mind if you�€™re often moving seats. However, safety wise this seat is surperior to most so the weight is a trade off for our family. The safety and comfort of this seat is second to none. Highly recommended! 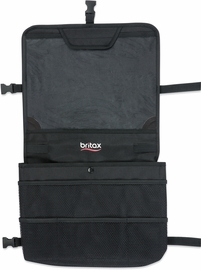 Love the Britax Frontier Clicktight! I love the ease of installation of this seat and the higher weight harness. 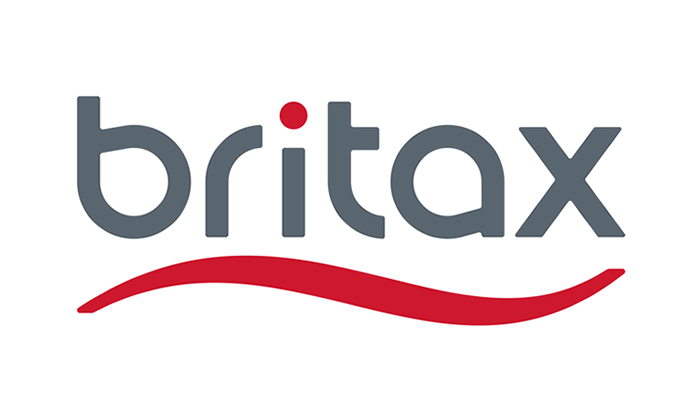 Britax has an excellent reputation for producing high quality products. The seat arrived in a very timely manner. ProsSturdy seat that will accommodate my grandson for years to come. 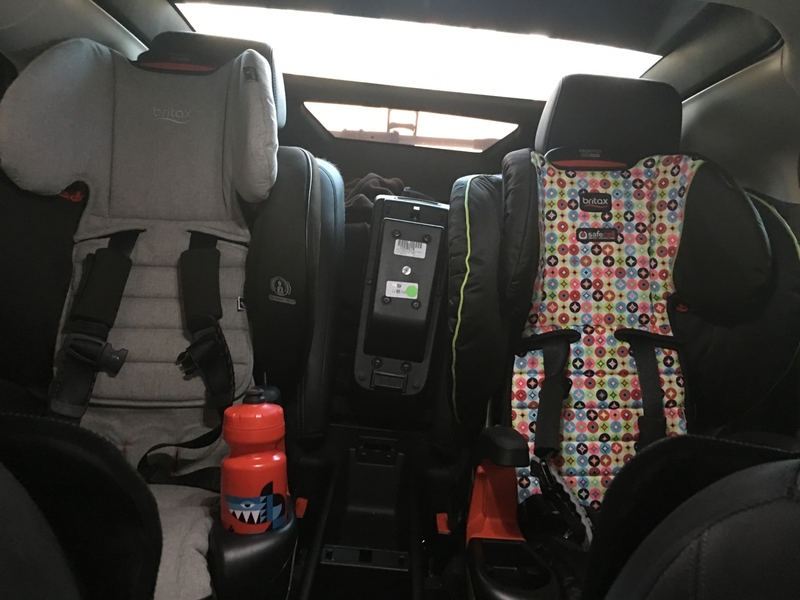 Having 4 kids, we�€™ve tried out a lot of seats...10 different models! It�€™s extremely easy to install and move between vehicles! (Suggestion: get out the manual for the first install!) My daughter says it�€™s very comfortable and has plenty of space for her treasures and a drink!! My only wish is that Britax would make one that does all that this one does AND rear facing. Seriously the best seat we�€™ve owned! I have been using this seat going on 2 years now and overall I'm very happy with my purchase. I love that you don't need to worry if you are getting the seat tight enough, you click the seat down and its instantly tight. Ive had seats in the past that I've worried if I got the seat securely tightened enough and this seat takes the guess work out of that! My child hasn't ever complained that its uncomfortable and we've gone on some long roadtrips. Excellent booster! Easy install, pretty, built well, heavy, comfy!! My 4 year old daughter and I absolutely love this seat. It is comfortable for her and easy to install for me. I love the cool flow gray fabric too. Fantastic value for a great car seat. My son fits perfectly, and very safe. I've installed 4 of these recently and they are very quick and easy to install. Once installed, they feel very secure to the seat. 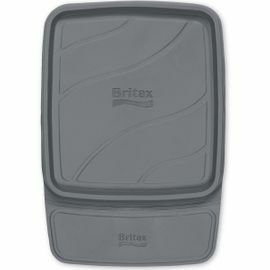 We've been very happy with the Britax brand on all of our car seats. This version provides our children plenty of room to grow, which is an additional benefit. As a mother of twins, we have always used the Diono seats due to their slimness and safety features and have been very satisfied with them, however frustrated with installation. After purchasing our new van, I knew I wanted to get a extra set of seats, so we would have seats in both vehicles instead of always installing and uninstalling. After research, I kept seeing these seats as #1 rated and everyone swore by the easy installation. I am so happy we bought these seats. The installation is SO easy and these seats don't budge, at all. I feel at ease knowing my kiddos will be safe for the remainder of their booster seat years! Thank you Britax! I had to get a new car seat because my daughter was 60 pounds and too tall to fit in her other one and I still wanted her in a 5 point harness. I love that this car seat is a 5 point harness up to 90 pounds. The car seat is actually slim and my daughter loves it. I would definitely buy this car seat again. Easy to use. Easy installation. Referred it to the other grandparents for their upgrade to the next level for our grandson. Told them to check Albee Baby for good prices. This is a GREAT SEAT! 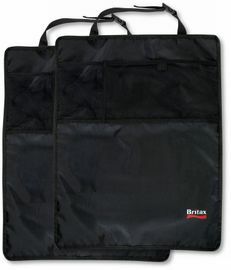 My 4 year old loves it.. We only purchase Britax producs and have never been disappointed by them. The clicktight feature is by far the easiest to use and the material is great! Love how easy it is to move from vehicle to vehicle. Also knowing that my child is safer in this carseat than others gives me a piece of mind. I love this brand of car seats and have 2 of them. However they are difficult to tighten down. I have to push my foot on the base of the seat while pulling the strap to tighten it. I feel like I'm cinching down a saddle or something. Otherwise I love the seats. If I have to struggle to get them tight enough, I guess its worth it to keep my precious cargo safe. Beat price around and super fast shipping! 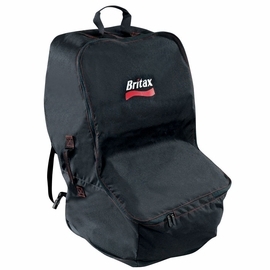 I love Britax, and this is the best price around! Fast shipping and the best part was that I called and an actual person answered the phone :) The woman answered my questions and was a delight to talk to. Not often these days do you get to speak to an actual person and not have to wait on hold for 30min. Great store and really nice customer service!!!! This is my 3rd britax frontier to purchase (I have 4 kids). It is a great seat and very versatile in that it can be used for many years. I currently have a 3 yr old, 6 year old, and 8 year old using frontier car seats. This pattern is very nice too - gender neutral and will hide any inevitable stains well. We just replaced our Euro $$$ brand seat with these and I�€™m obsessed with my Britax. It is a large seat, but perfect for my captain chairs in the second row. Our LOs always fall asleep now and the seat feels sturdy and safe. Definitely a great, well made seat for the price point! ProsBeing an ER RN & Mom I?m happy that I can keep my wiggle worms in a harness till 90lbs with theses seats! ConsCan?t think of any cons!!! We really love this car seat, our daughter loves the pattern, it�€™s fast to install and is so much safer than we could have ever expected! Clicktight is easiest way to install a seat! We bought other brands for 2 early on convertibles and have since given these to grandparents for occasional use because after buying a Clicktight my husband refuses to deal with install on anything else. And who doesn't like help with these things?! Our oldest is a petite miss who at this rate will hit the 40lbs required for a seatbelt-based High Backed Booster when she's about 8 years old, so it was great to find an option that seemed more like her friends "big girl" seats while still retaining the harness option. We have 3 Click Tight car seats now. They are built for stability, comfort and ease. Theses are so easy to install and stay in place. They are a bit pricey, but in the long run worth the extra money. I went ahead and bought this seat on sale with some of my rewards, and I'm so happy that I did. The clicktight feature is phenomenal. Literally install a seat in under 2 mins, even with crawling around to do the tether. If you are on the fence about the extra money for clicktight, it is definitely worth it. Love this booster seat! Easy to install in our vehicle and our daughter loves it! It is quite heavy, so I wouldn't want to transfer to and from multiple vehicles often. I would purchase this again and recommend to anyone looking for a harness booster seat. My son didn�€™t complain at all sitting on this car seat. Its very heavy and sturdy which we like. Definitely recommend this car seat! I love how comfy the chair is. It has a very the arm rests & drink holder. Love how it will change into a booster. Both parents have the same car seat & then myself (grandma) and other grandma all have this exact car seat. I have this same seat for my older son and just got this one for my daughter. The color/pattern is so great for a girl! 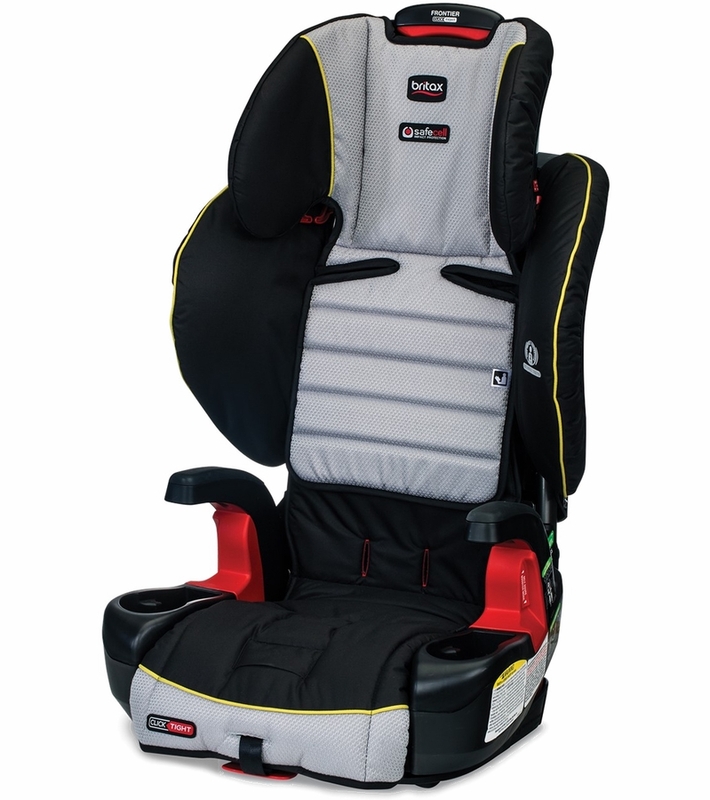 The seat seems to be very comfortable for the child while still keeping up the safety standards Britax is known for. Easy quick shipping through Albee Baby, and they always have great prices. We love this booster so much that we went ahead and purchased a second, so that we could have one in both cars. 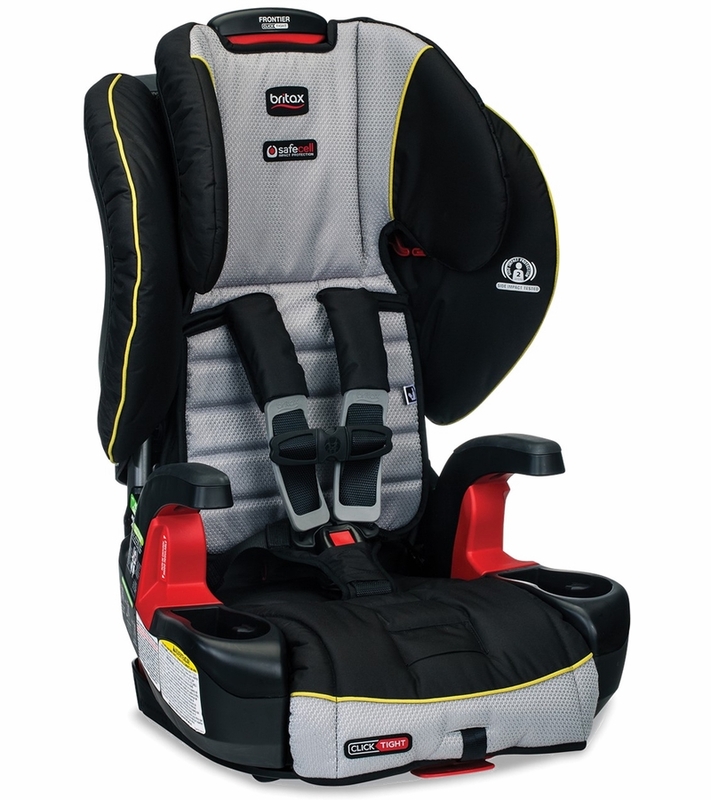 It works well for older children, since the 5 point harness can fit up to 90 pounds. Fast shipping from AlbeeBaby and we love the quality of the seat! I am so happy with how securely this booster-to-harness seat installs. I had a different brand rear-to-forward facing seat previously that, as my daughter grew, felt way to bulky for her size and was difficult for her to climb into herself when forward facing. On my first attempt to install this booster seat using the lower latches that attach to the car frame, I didn't follow the directions to a T, and that belt was too tight - I had a difficult time reopening the booster seat compartment to readjust the position of the seat. When I left the appropriate slack for the booster seat to move only one inch, after closing that compartment, the seat was completely secure and did not move at all. Really happy. I chose this model because of the high weight limit while still using the harness. Hope to have this for years! Very good booster car seat. 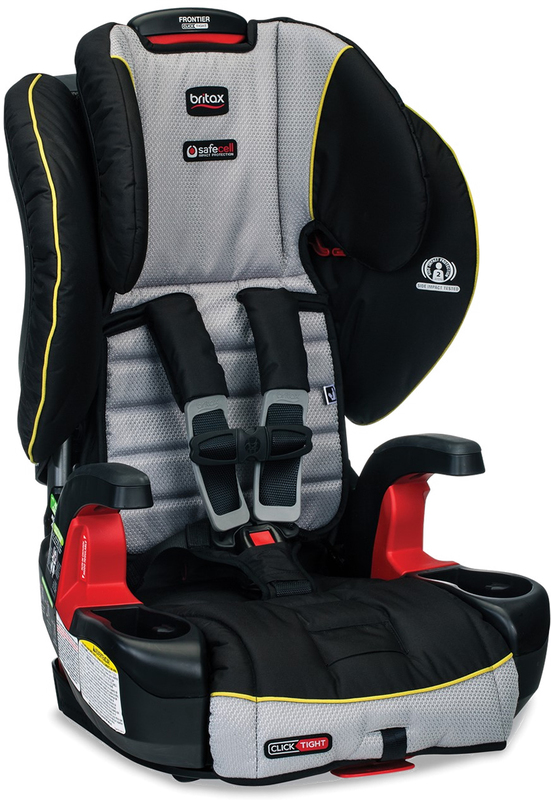 I bought this Britax Frontier ClickTight Harness Booster Car Seat for my 4 year-old. He loves it and it's very comfortable. I will buy again for my daughter when she gets older. Perfect for my tall 4 year old ! This was the perfect solution for my tall 4 year old after she grow out of our Diano RXT. Happy we can keep her in a 5 point for a few more years now ! And I am really enjoying the stress free installation with the click tight ! 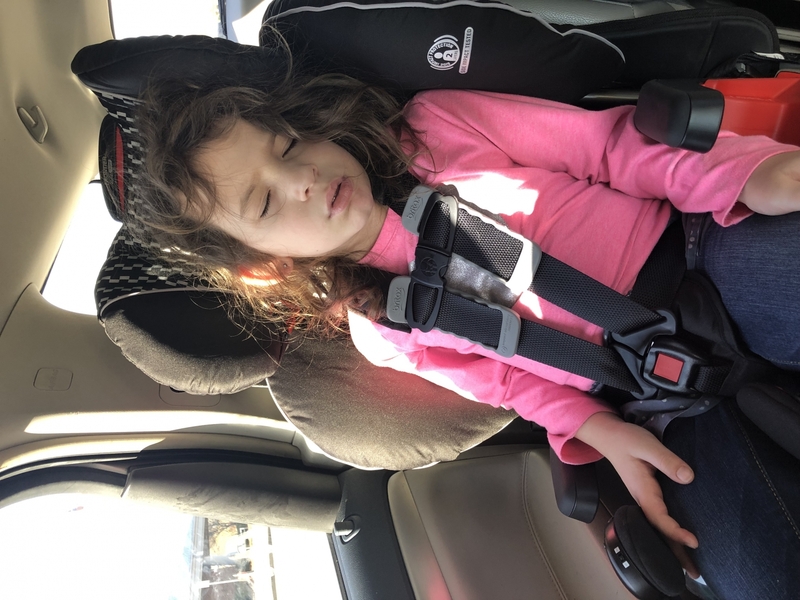 After a recent car accident forced me to replace a wonderful Britax car seat for my 4 year old, I knew I had one big requirement, a five point harness booster. I choose this one because of the color pattern, the click connect feature and the five point harness. It's so easy to install and is very secure. It sits more upright than the Roundabout (his old seat), but at his age that is good anyway. The adjustment for the height of the shoulder straps is also easy and can make this car seat easily compatible to different sized children very quickly. I think this is the best seat on the market. This is the perfect booster for my six year old. Its height and weight capacity will keep him safe until he no longer needs to be in a car seat. It's great quality and will definitely last and be pasted down to my two year old when he is ready! Love the material to keep him cool as we live in the California desert!